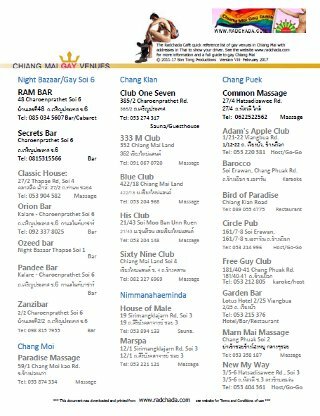 We strive to keep our venue listings on our Chiang Mai Gay Guide as up to date as possible. If you know of any new gay venues that have opened recently that we haven’t included, please let us know by filling in the form below. You can also use the form to tell us about venues that have changed or closed. Please use the “other information” section to describe any issues. Chiang Mai has experienced rapid expansion within the city in the last few years. New Pubs, Clubs, Bars Restaurants and coffee shops open almost daily. To reflect this we are also interested in our readers recommendations for places that, although not gay would be of interest to, or are popular with gay people. Please also use this form to suggest such places for inclusion. For non gay venues it would be particularly helpful if you could indicate how gay friendly you believe them to be.